The incidence of diabetes is increasing day by day. Being a silent killer, it is attacking the young generation secretly. Diabetes Mellitus (type 2) is a chronic metabolic disorder in which the body is unable to make proper use of glucose, resulting in the condition of hyperglycemia (high blood sugar). Glucose comes from the food we eat and is also made in liver and muscles. The blood carries glucose to all the cells in our body. Insulin, a chemical (or hormone) produced in the pancreas, is responsible for the uptake of glucose into cells for energy. Decreased level of insulin affects this mechanism leading to increased glucose in the blood stream. Ayurvedic treatment for diabetes has been a part of traditional medicine for thousands of years. The natural herbs focus on lowering blood sugar and reducing the damaging effects of the disease. 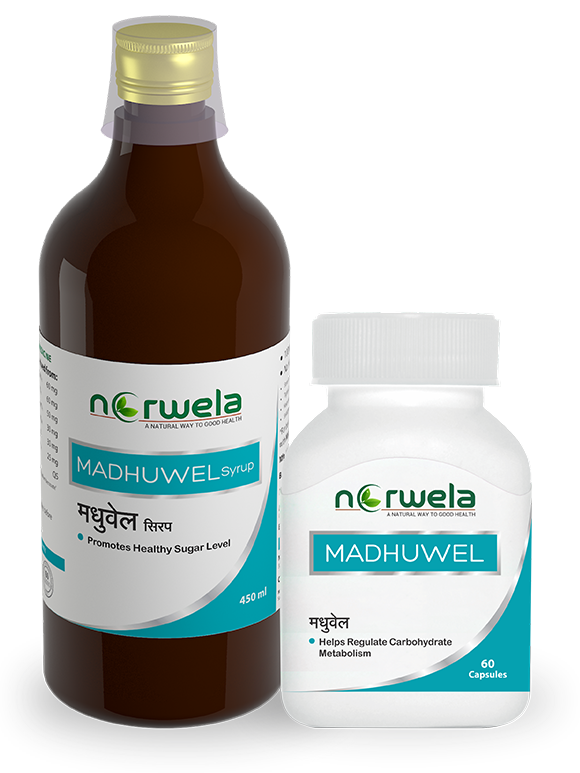 Norwela’s Madhuwel is a combination of Ayurvedic syrup and capsule based on ancient Ayurvedic Treatment for Diabetes that has helped many to manage their diabetes. Madhuwel is made of twenty-one herbal extracts that have been used for many years in traditional Indian Ayurvedic medicine. Madhuwel is clinically tested under supervision renowned Ayurvedic physician. Herbs that are used in Madhuwel are generally regarded as safe for human consumption and as such they do not have any ill effect on you. We recommend proper nutrition, a good exercise program, and continued monitoring of blood glucose levels. Helps to rejuvenate beta-cells of the islets of Pancreas. Helps in preventing micro-vascular damage. Helps in preventing diabetic complication ex- diabetic retinopathy. Based on ancient Ayurvedic science.